When two or more users need access to a record or folder in Xton Access Manager (XTAM), then the Owner of this object needs to share access to it which means to create or modify its permissions. When the permissions are modified and shared with a user (or group), then the Owner also needs to specify which level of control this user (or group) should have on the object. Before we show you how to share, let’s review the basic Permission model in XTAM. Sharing and Permissions consists of a few key concepts; Users or Groups (Principals), Record Control, Session Control, Task Control, Inheritance and Global Roles. For an up-to-date list of permissions, please review Xton Access Manager Permissions. Users or Groups (Principals): These are the users or a group of users (Principals) that will be granted the shared permissions to the object. These may be local users or groups or Active Directory user or groups. Record Control: These are the defined set of permissions that will be granted to the user or group. This includes but is not limited to view, edit and delete operations on this object. Session Control: If the record contains a host connection, then this will determine if the user or group can establish a secure session to this host. Task Control: If the record contains a task, then this will determine if the user or group can execute, review or manage these tasks. Inheritance: Inheritance is used throughout XTAM to more quickly establish a parent/child relationship between objects. If a parent object has a specific set of permissions and a child inherits from it, then that child object will identical permissions. If a child has unique permissions (not inherited), then the parent and child may have a different set of permissions associated to them. This concept is important when determining how you want to structure your sharing and permission model for Records and Folders. Global Roles: These are the user or group of users that will be granted limited or full system wide access to XTAM. Login to XTAM with an account that has Owner permissions to the Record or Folder you want to share with others. Open the Folder or View the Record that you wish to share and click the Permissions button. A view detailing the current permissions associated to this object will display. The Inheritance concept described above will become visible immediately when looking at an object’s permissions. If this object inherits permissions from its parent, the Title will state it inherits and the parent from which it does. You will also see a button labeled Make Unique. If this object does not inherit (unique permissions), then it will not state this in the Title. You will also see three buttons; Grant Permissions, Revoke Permissions and Inherit from Parent. If you want to share this object but it inherits from its parent, then you will need to modify the parent’s permissions. Once modified, the parent’s permissions will be automatically made available on this child object via inheritance. If you want to share this object but don’t want to modify the parent, then you will need to make this objects’s permissions unique and then Grant Permissions directly to it. In this scenario, both the parent and child will have different permissions which allows for greater control over sharing; however, it also makes the management of these objects more difficult. For the sake of this example, let’s assume the object has unique permissions or is the Root Folder. Click the Grant Permission button located in the toolbar. 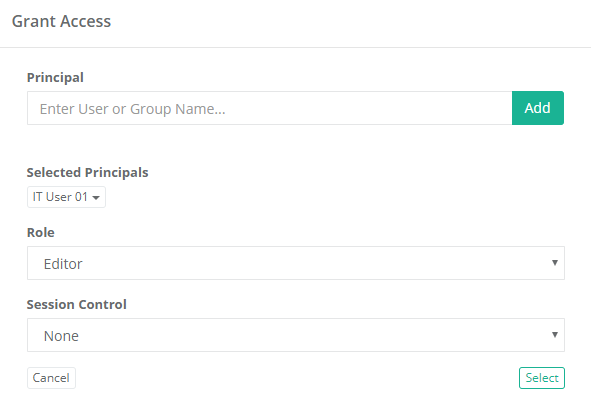 Enter the user or group name in the Principal field and click Add. This principal will now be listed below the field. Now select the Role and Session Control level from the drop down menu that will be granted to this principal. Click Select to complete the operation. The Grant Permission dialog will close and the object’s permission will now reflect the modification(s) just made. Login to XTAM with an account that has Owner permissions to the Record or Folder you want to unshare with others. Open the Folder or View the Record that you wish to unshare and click the Permissions button. Locate and select the Users or Groups whose permissions you wish to revoke and check the box next to their entry. Click the Revoke Permission button. The object’s permission will refresh and immediately reflect the modification(s) just made. The selected User or Group no longer has access to this object. Open the Folder or View the Record that you wish to Edit and click the Permissions button. Locate the User or Group whose permissions you wish to Edit and click the Edit button to the right. In the Permission dialog that appears, make the necessary changes and click Select to complete the operation. The object’s permission will refresh and immediately reflect the modification(s) just made. Click the Inherit from Parent button. Read and then confirm that you understand this operation by clicking OK. The object’s permission will refresh and immediately display that it is now inheriting from its parent. All previously unique permissions and sharing on this object were revoked and those of its parent have been granted via inheritance.